I feel like I'm going back to my roots with the product that I'm opening up today. I fondly remember opening up a lot of these blasters when I first started my Youtube channel. 2010/11 Score may not be a product that has a lot of value, but it certainly does hold a lot of memories. These blasters started off at a very reasonable $9.95, but I was able to pick this one up for under $4. Wow, that's really low. Each blaster of 10/11 Score contains 11 packs to open up. The packs hold a variety of inserts and rookie cards as well as some pretty rare parallel cards. The rare parallel cards I'm talking about are the French back cards. These were supposedly limited to just 10 copies each and the only way to tell you had one was to see a sentence written in French on the back. Collectors who don't know what to look for will never know if they had gotten one. I thought that this box was a typical Score blaster to open up. Each pack had something to look forward to getting... which is always a good thing in retail. Insert cards and rookies were the primary pulls out of the blasters, and I really enjoyed seeing what came out of each pack. Panini has always done a good job of creating interesting themed insert sets, and that's something I really appreciate. The glossy cards were inserted one per pack, but as you could probably tell from the video they were not easy to spot. Now that this product is a bit older, some will probably purchase blasters and not even know they are there. I wish Panini would have done a better job designating them as something different. 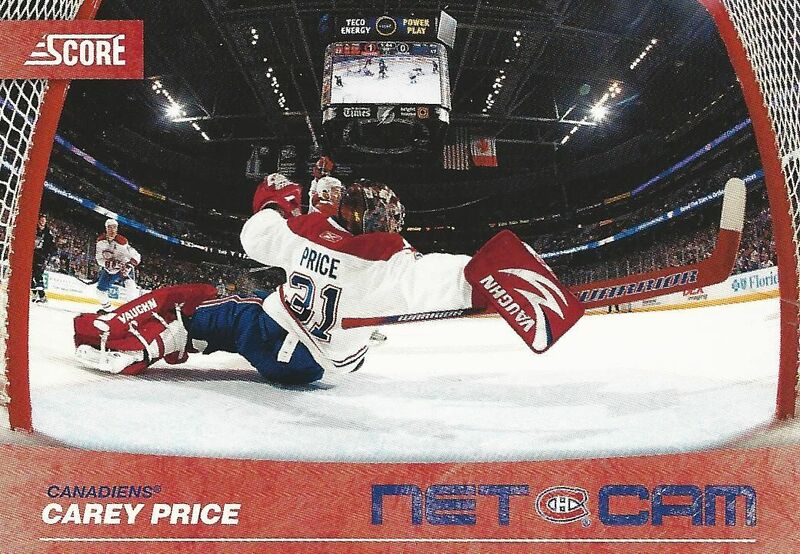 There have been a lot of Net Cam type cards produced since 2010, but back then they were still pretty fresh and new. This is actually a pretty awesome shot from the back of Carey Price - it's a very dynamic photo. 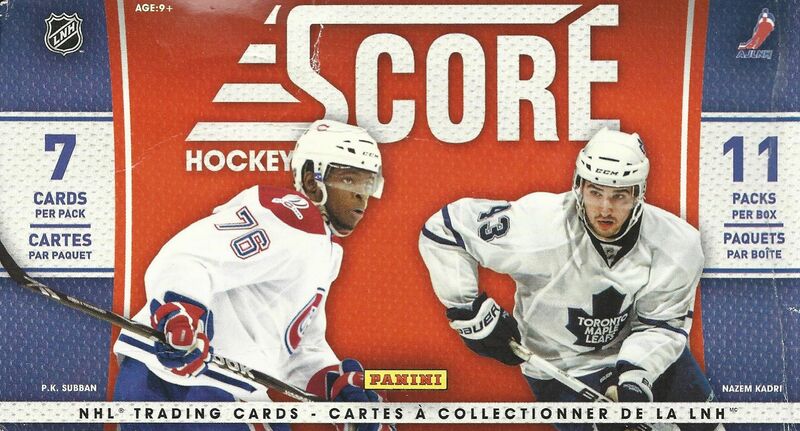 I talked about cool Panini inserts just a second ago, and this is definitely one of them. 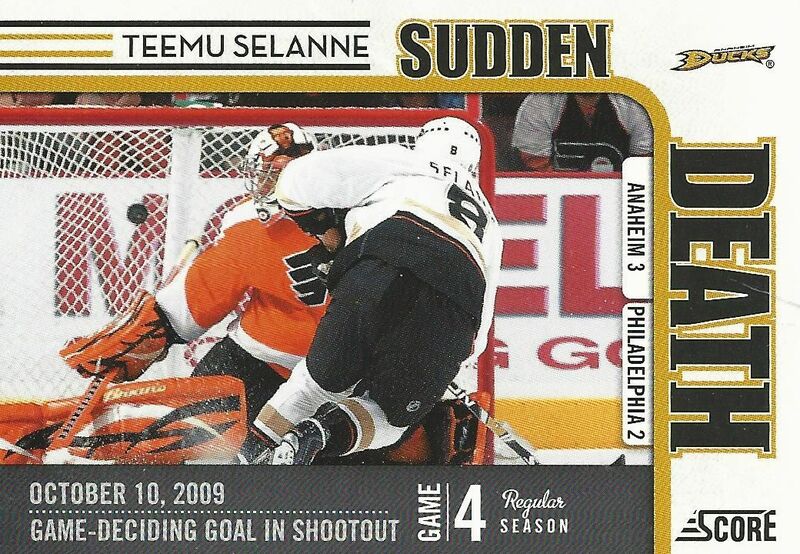 This Sudden Death insert card highlights a very specific moment during the NHL season and does it in a very sweet looking way. 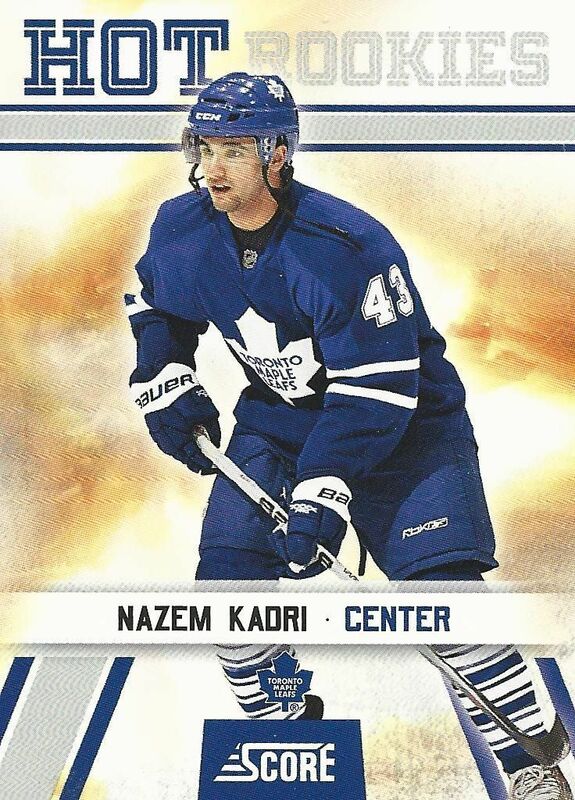 I haven't kept up with how Kadri has been doing at all, but when he was a rookie back in 2010 his cards were pretty hot. I remember him having some really rough patches as he came into the NHL. This isn't a huge pull today, but back then it would have been a sweet little pick up. It's very hard to beat a blaster for under four dollars for value. This was a great deal and a fun blaster box to open. The good thing about Score is that you always have a chance to pull something fun out. If you're looking for a little bit of fun at a rock bottom price, definitely consider getting an old box of 10/11 Score! Update on Kadri - Mike Babcock recently said Kadri is currently the best Leaf forward. If you have checked the standings lately, that should be a fairly accurate reflection of how Kadri is doing.